We stock a large range of cotinuous hinges in various materials ranging in thickness from 0.9mm to 3.0mm. 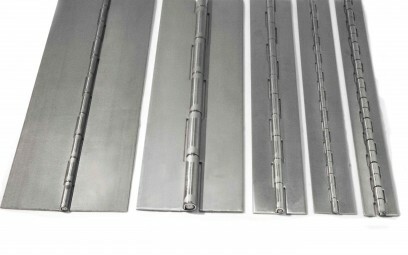 Open widths from 19mm to 100mm are kept in stock for immediate delivery and larger widths can be made to order. Our accurate cropping service provides a good clean finish for short lengths of continuous hinge and needs no de-burring for normal usage. 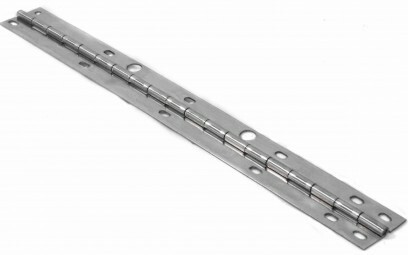 The continuous hinges kept in stock are supplied without holes (blanks). If required holes or slots can be pierced either to our standard pattern or to suit your exact requirements. All of our standard stock items can be modified to your specifications, such as hole piercing, notching and bending.